You are here: Home › Attention All! This address was delivered 8 August 1844 in Nauvoo, Illinois after the martyrdom of The Prophet Joseph Smith. It was perhaps the most important in President Young’s long and illustrious career. In it, he refuted Sidney Rigdon’s call for a “guardian” to be called to preside over the Church. President Young put forth the position of the Quorum of the Twelve Apostles, and most importantly, the mantle of Joseph’s leadership was both seen and heard to descend up him as he took the form and the voice of the deceased Prophet. Attention all! This congregation makes me think of the days of King Benjamin, the multitude being so great that all could not hear. I request the brethren not to have any feelings for being convened this afternoon, for it is necessary; we want you all to be still and give attention, that all may hear. Let none complain because of the situation of the congregation, we will do the best we can. For the first time in my life, for the first time in your lives, for the first time in the kingdom of God in the 19th century, without a Prophet at our head, do I step forth to act in my calling in connection with the Quorum of the Twelve, as Apostles of Jesus Christ unto this generation—Apostles whom God has called by revelation through the Prophet Joseph, who are ordained and anointed to bear off the keys of the kingdom of God in all the world. This people have hitherto walked by sight and not by faith. You have had the Prophet in your midst. Do you all understand? You have walked by sight and without much pleading to the Lord to know whether things were right or not. Heretofore you have had a Prophet as the mouth of the Lord to speak to you, but he has sealed his testimony with his blood, and now, for the first time, are you called to walk by faith, not by sight. The first position I take in behalf of the Twelve and the people is, to ask a few questions. I ask the Latter-day Saints: do you, as individuals, at this time, want to choose a Prophet or a guardian? Inasmuch as our Prophet and Patriarch are taken from our midst, do you want some one to guard, to guide and lead you through this world into the kingdom of God, or not? All that want some person to be a guardian or a Prophet, a spokesman or something else, signify it by raising the right hand. (No votes). When I came to this stand I had peculiar feelings and impressions. The faces of this people seem to say, we want a shepherd to guide and lead us through this world. All that want to draw away a party from the church after them, let them do it if they can, but they will not prosper. What do the people want? I feel as though I wanted the privilege to weep and mourn for thirty days at least, then rise up, shake myself, and tell the people what the Lord wants of them; although my heart is too full of mourning to launch forth into business transactions and the organization of the church, I feel compelled this day to step forth in the discharge of those duties God has placed upon me. I now wish to speak of the organization of the Church of Jesus Christ of Latter-day Saints. If the church is organized, and you want to know how it is organized, I will tell you. I know your feelings— do you want me to tell your feelings? Here is President Rigdon, who was counselor to Joseph. I ask, where are Joseph and Hyrum? They are gone beyond the veil; and if Elder Rigdon wants to act as his counselor, he must go beyond the veil where he is. There has been much said about President Rigdon being President of the Church, and leading the people, being the head, etc. Brother Rigdon has come 1,600 miles to tell you what he wants to do for you. If the people want President Rigdon to lead them they may have him; but I say unto you that the Quorum of the Twelve have the keys of the kingdom of God in all the world. The Twelve are appointed by the finger of God. Here is Brigham, have his knees ever faltered? Have his lips ever quivered? Here is Heber and the rest of the Twelve, an independent body who have the keys of the priesthood—the keys of the kingdom of God to deliver to all the world: this is true, so help me God. They stand next to Joseph, and are as the First Presidency of the Church. I do not know whether my enemies will take my life or not, and I do not care, for I want to be with the man I love. You cannot fill the office of a prophet, seer and revelator: God must do this. You are like children without a father and sheep without a shepherd, You must not appoint any man at our head; if you should, the Twelve must ordain him. You cannot appoint a man at our head; but if you do want any other man or men to . lead you, take them and we will go our way to build up the kingdom in all the world. I know who are Joseph’s friends, and who are his enemies. I know where the keys of the kingdom are, and where they will eternally be. You cannot call a man to be a prophet; you cannot take Elder Rigdon and place him above the Twelve; if so, he must be ordained by them. I tell you there is an over anxiety to hurry matters here. You cannot take any man and put him at the head; you would scatter the saints to the four winds, you would sever the priesthood. So long as we remain as we are, the heavenly Head is in constant cooperation with us; and if you go out of that course, God will have nothing to do with you. Again, perhaps some think that our beloved Brother Rigdon would not be honored, would not be looked to as a friend; but if he does right and remains faithful he will not act against our counsel nor we against his, but act together, and we shall be as one. I again repeat, no man can stand at our head, except God reveals it from the heavens. I have spared no pains to learn my lesson of the kingdom in this world and in the eternal worlds; and if it were not so, I could go and live in peace; but for the gospel and your sakes I shall stand in my place. We are liable to be killed all the day long. You have never lived by faith. Brother Joseph, the Prophet, has laid the foundation for a great work, and we will build upon it; you have never seen the quorums built one upon another. There is an almighty foundation laid, and we can build a kingdom such as there never was in the world: we can build a kingdom faster than satan can kill the saints off. What do you want? Do you want a patriarch for the whole church? To this we are perfectly willing. 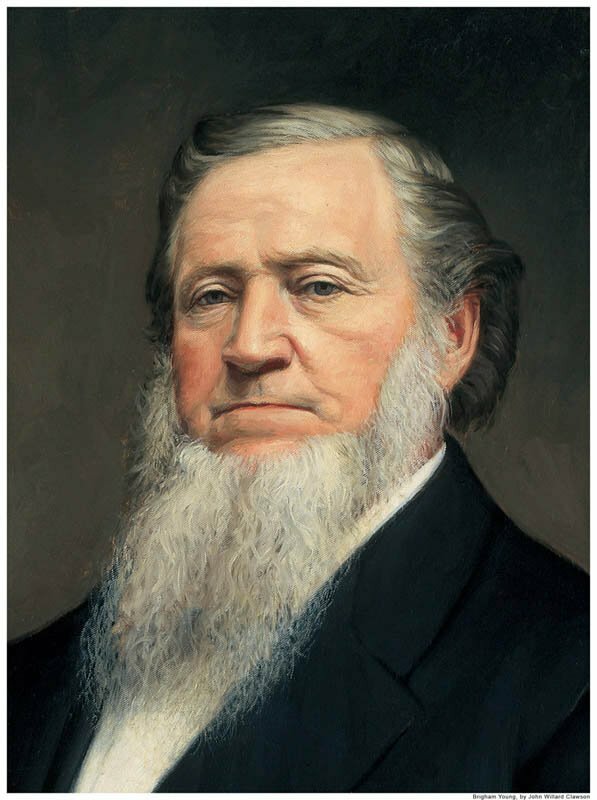 If Brother Samuel H. Smith had been living, it would have been his right and privilege; but he is dead, he is gone to Joseph and Hyrum, he is out of the reach of bullets and spears, and he can waft himself with his brothers, his friends and the saints. Do you want a patriarch? Here is brother William [Smith] left; here is Uncle John Smith, uncle to the Prophet Joseph left; it is their right. The right of patriarchal blessings belongs to Joseph’s family. Do you want a Trustee-in-Trust? Has there been a bishop who has stood in his lot yet? What is his business? To take charge of the temporal affairs, so that the Twelve and the elders may go on their business. Joseph condescended to do their business for them. Joseph condescended to offer himself for president of the United States, and it was a great condescension. Do you want a spokesman? Here are Elder Rigdon, Brother Amasa Lyman [whom Joseph expected to take as a counselor] and myself. Do you want the church properly organized, or do you want a spokesman to be chief cook and bottle-washer? Elder Rigdon claims to be spokesman to the Prophet. Very well, he was; but can he now act in that office: If he wants now to be a spokesman to the Prophet, he must go to the other side of the veil, for the Prophet is there, but Elder Rigdon is here. Why will Elder Rigdon be a fool? Who knows anything of the priesthood, or of the organization of the kingdom of God. I am plain. Does this church want it as God organized it? Or do you want to clip the power of the priesthood, and let those who have the keys of the priesthood go and build up the kingdom in all the world, wherever the people will hear them? If there is a spokesman, if he is a king and priest, let him go and build up a kingdom unto himself; that is his right and it is the right of many here but the Twelve are at the head of it. I want to live on the earth and spread truth through all the world. You saints of latter-days want things right. If 10,000 men rise up and say they have the Prophet Joseph Smith’s shoes, I know they are impostors. In the priesthood you have a right to build up a kingdom, if you know how the church is organized. Now, if you want Sidney Rigdon or William Law to lead you, or anybody else, you are welcome to them; but I tell you, in the name of the Lord that no man can put another between the Twelve and the Prophet Joseph. Why? Because Joseph was their file leader, and he has committed into their hands the keys of the kingdom in this last dispensation, for all the world; don’t put a thread between the priesthood and God. I will ask, who has stood next to Joseph and Hyrum? I have, and I will stand next to him. We have a head, and that head is the Apostleship, the spirit and power of Joseph, and we can now begin to see the necessity of that Apostleship. Brother Rigdon was at his side—not above. No man has a right to counsel the Twelve but Joseph Smith. Think of these things. You cannot appoint a prophet; but if you let the Twelve remain and act in their place, the keys of the kingdom are with them and they can manage the affairs of the church and direct all things aright. let him be careful what he does, lest that thread which binds us together is cut asunder. May God bless you all.